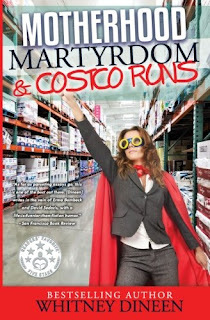 After yesterday’s post about the things my daughter has done in the past month to drive me crazy, I read the very relatable Motherhood Martyrdom & Costco Runs by Whitney Dineen. It was just what I needed to laugh and focus my thoughts on the crazy that is motherhood and the joy it brings. This book is a collection of short essays about Dineen’s personal experiences and thoughts on mothering, along with several stories about her love of all things Costco (who can blame her?). She is honest and funny. However, she does a nice job of reminding readers that while motherhood involves plenty of hysterics, children are a joy. After her personal struggles with miscarriage, she is especially sensitive to the fact that children are a gift – even when they drive you nuts. If you are looking for a fun, quick read this summer (or anytime you need to be reminded that mothering is hard, but beautiful), give this book a try.